Pulse Amplifiers differ from Pulse Modulated Amplifiers, in that they are designed to amplify pulses, as opposed to being turned off and on by a pulse. Many of L3 Narda-MITEQ's amplifiers can be used for pulse amplification, but only selected models appear in this section. Some designs specifically handle 12.5 Gb/S NRZ or RZ data strings, either linearly or saturated. In order to determine whether a particular amplifier will amplify and maintain the pulse shape, you need to consider the following: The 3 dB bandwidth (preferably the 1 dB BW for some applications) must be wide enough to meet the required rise and fall times. For a normal amplifier, the approximate rise-time = 0.35/(3dB BW); however, if a sharp filter is used the rise and fall times can be roughly doubled. To be a good Pulse Amplifier, the phase linearity (group delay variation) also must be quite good without resonances or sharp variations. This goes along with a wide band and a relatively flat frequency response. To limit the overshoot of a square pulse, the frequency response at the third and higher harmonics should be equal to or less than that of the fundamental Fourier series component. Bessel filters are sometimes used to achieve this. For standard NRZ data (none RF envelope), the maximum length of zeros or ones is limited by the low end response, but for modulated RF this limitation no longer exists. I.E. a constant CW or a constant no signal will indefinitely detect to a constant level. For the Fourier components to properly reconstruct the pulse shape, the group delay variation and amplitude flatness must be sufficient. 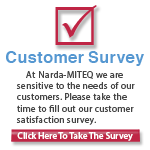 L3 Narda-MITEQ's wideband amplifiers generally have excellent group delay characteristics and gentle gain variations, but these items should be specified and tested. With our automated testing, these are relatively easy to measure. We have delivered thousands of amplifiers for the 10 and 12.5 Gb/S applications and have digital communication analyzers capable of looking at pulse widths less than 20 pS rise and fall times. We also have a DCA setup with a 65 GHz BW.